“I was told [by Indian officials outside the Pakistan high commission] that the Indian government has boycotted the event and therefore, it is up to our conscience whether to attend," a journalist said. New Delhi: On a day when the Indian government boycotted the Pakistani high commission’s reception and stationed plain-clothed officials outside the gates to document the names of guests, Pakistan Prime Minister Imran Khan thanked the Indian Prime Minister Narendra Modi for his letter conveying “best wishes” on Pakistan Day. On Friday, the Pakistani high commission’s national day reception was a relatively muted affair. 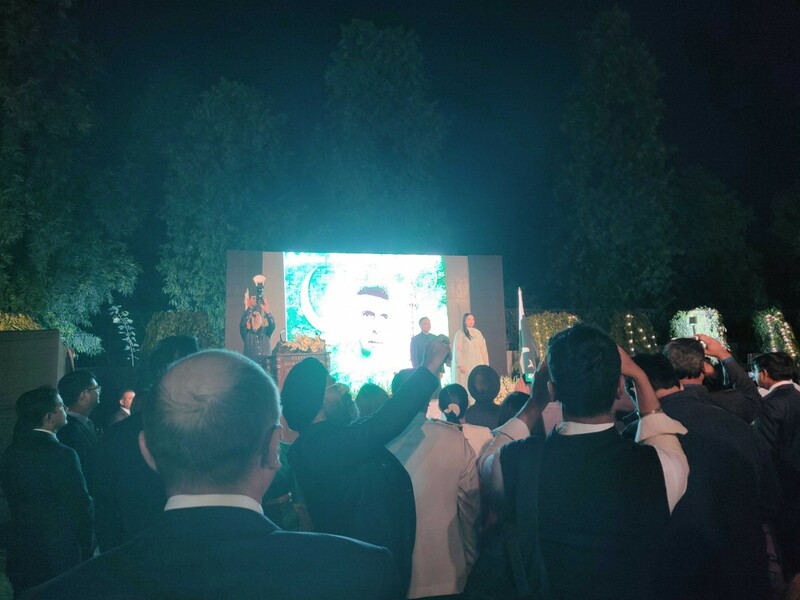 There was no chief guest on the dais from the host country, but the Indian national anthem was sung first as per protocol as diplomats and guests stood on the lawns of the Pakistani high commission in Delhi. Outside the gates, Indian invitees were being told by policemen in mufti to listen to their “conscience” and turn back. A few hours earlier, the Ministry of External Affairs announced that there will be no representatives from the Indian government at the national day receptions in Delhi and Islamabad. This was an unprecedented step even by the standards of volatile India-Pakistan relations. In the last four years, an Indian minister was always the chief guest at the reception – a customary protocol for national day events hosted by all diplomatic missions. While Indian government machinery was being used to ensure that there was sparse attendance at the reception, the Indian prime minister had written a letter to Imran Khan. The letter came to light when Khan tweeted his thanks to Modi, with two lines from the purported missive. Welcoming “PM Modi’s message to our people”, Khan added, “As we celebrate Pakistan Day I believe it is time to begin a comprehensive dialogue with India to address & resolve all issues, esp the central issue of Kashmir, & forge a new relationship based on peace & prosperity for all our people”. There was no official response from the Indian side. However, Indian official sources claimed that the Modi’s letter was a “customary message” that is sent on national days to other heads of states or government. They asserted that the Indian prime minister had “highlighted the importance of a terror-free South Asia”. “It is an unsigned letter which goes to Pakistan on their national day as a standard diplomatic practice. Letter sent to all countries with whom India has diplomatic relations,” said official sources. The argument put forth by India for the boycott of the Pakistan Day reception was that the Pakistan high commission had invited separatist Hurriyat leaders. In the last four years, Pakistan has always invited Hurriyat leaders, but Indian ministers had still attended the event – V.K. Singh in 2015, Prakash Javadekar in 2016, M.J. Akbar in 2017 and Gajendra Singh Shekhawat last year. After the announcement of the boycott, invitees to the reception found themselves under the government’s gaze in the evening. There was a heightened security presence and manned barriers were set up all around the high commission building located in the diplomatic enclave. At a barrier set up before entry into the Pakistan high commission, cars with Indian numbers plates were being stopped, while diplomatic vehicles breezed through. Once stopped, an Indian official in civilian clothes – and sometimes a uniformed Delhi police officer – asked the car’s inhabitants whether they were attending the reception. If they replied in the positive, all of them got the same message. “I was told that the Indian government has boycotted the event and therefore, it is up to our conscience whether to attend the event. He suggested that it would be better if we don’t,” said a journalist who was attending the reception on assignment. Another invitee said that an official told him that India was a democracy and therefore, the message was just a request. “I told him that this is a democracy and that’s why I am going,” he stated. One of the many invitees was Jawahar Lal Sareen, a former IAS officer, who has been attending to Pakistan national day celebrations for years. “I was born in Lahore,” he said. With his wife next to him, 74-year-old Sareen asserted that this was the first time that he had been stopped and told not to attend the annual reception. “This is the first time ever that this has happened with me.” When he said that his plans remained unchanged, Sareen said that the Indian officials not only took details of his identification documents, but also photographed his car number plate. Former Planning Commission member Syeda Saiyidain Hameed also said that her details were noted down by an Indian official. “They also took a picture of my invitation card,” she said. Similarly, journalists covering the event were also ‘advised’ not to attend. If they insisted that their presence was a part of their professional work, their names and phone numbers were taken down. A senior journalist of a business paper said that she couldn’t remember this kind of restriction even after at Pakistan high commission’s first official reception in Delhi after the end of the Kargil war. Another guest commented that while Pakistan had been known to regularly intimidate guests to the Indian high commission in New Delhi, there had never been any such incidents in India, till now. None of the senior Hurriyat leaders came for the reception, with most of them either behind bars or facing travel restrictions. However, the Delhi police detained a Kashmiri human rights activist, Mohammad Ahsan Untoo, just before he entered the Pakistan high commission. Untoo, who runs an organisation called the International Forum of Justice and Human Rights, had recently met jailed Jammu and Kashmir Liberation leader Yasin Malik in Jammu. Earlier on Friday, the JKLF was banned by India following a decision of the Cabinet Committee on Security. Inside the high commission, the crowd was thinner than previous years. The capital’s diplomatic community, however, had turned up in strength. The formal portion of the event began with the Pakistan high commissioner, Sohail Mehmood, going on the specially-built dais. In previous years, he escorted the chief guest, but this time, he was accompanied by his wife. An instrumental version of ‘Jana Gana Mana’ was first played, following by a recording of the Pakistani anthem. Mehmood then gave a short speech, in which he alluded to the “very difficult time” in relations between India and Pakistan. India had called back its high commissioner, Ajay Bisaria, to Delhi “for consultations” after the deadly attack that left over 40 Indian security personnel dead on February 14 at Pulwama in Jammu and Kashmir. The Pakistan-based group Jaish-e-Mohammed claimed responsibility for the attack. Pakistan reciprocated and Mehmood was in Islamabad for nearly two weeks. On February 26, India conducted airstrikes on a facility run by the Jaish-e-Mohammed in Pakistan’s Khyber Pakhtunkhwa province. A day later, Pakistan air force dropped bombs inside Indian territory. During the aerial skirmish on February 27, one Indian Mig-21 was downed and the pilot evacuated inside Pakistan. India later claimed that a Pakistani F-16 was also hit, but the debris is yet to be found. Striking an unusually optimistic note, Mehmood said, “Prime Minister Imran Khan’s decision to release Wing Commander Abhinandan, return of the two High Commissioners to their respective Missions, and bilateral meetings to develop modalities for operationalization of the Kartarpur Corridor are steps in a positive direction”. He added that the process of de-escalation has to be “consolidated” and ties have to be stabilised “against further shocks”. Following the return of Wing Commander Abhinandan Varthaman, there had been a de-escalation from both sides. India has asserted that the situation is back to normal, but Pakistan has yet to re-open its airspace fully after it was closed on February 26. Mehmood reiterated that dialogue between the two countries was necessary to go forward. “One key take-away from recent developments is that the lack of engagement creates dangerous vacuum and serious risks for the relationship. As we limp back from the brink, we must make sure that we act with wisdom to find a way forward – for our countries, and for our peoples,” he stated. The senior Pakistani diplomat stated that a relationship “based on sovereign equality, mutual respect and mutual interest is the best guarantee for a peaceful and prosperous future”.